CHEMWASH™ is 100% New Zealand owned and was the first company in New Zealand to use the combination of detergents, low pressure and a then unique fan washing procedure. Our Low-Pressure system is specialised for washing & cleaning of all exterior surfaces. 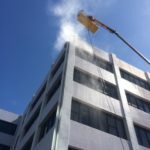 We wash houses, commercial buildings, shop fronts, concrete, paths, guttering, roof cleaning, fences, outdoor furniture, outdoor structures and more. Our Commercial services include shop fronts and commercial properties. We also offer on-going contracts. We clean all exterior surfaces, including siding, roofs, gutters, decks, walkways, outdoor structures & more. Find out more about Chemwash, our nationally licensed agents, what we do, and how we do it! If you’re thinking of selling your home, you’ll be wanting to get it into prime condition before opening the doors to prospective buyers. But how do you know what will actually add value? "Please pass on to the guys that did the work that I am so happy with the result, it is far better than I expected and they obviously did a really great job."